Hooded tops, baseball caps and swearing have been outlawed at Bluewater shopping centre in Kent as part of a crackdown on anti-social behaviour. The retail and leisure complex is bringing in a zero-tolerance approach to intimidating conduct. The move has been backed by Kent Police which has a dedicated on-site team. Bluewater property manager Helen Smith said the decision was taken because there had been "issues" in the centre "at certain times of the week". Managers have drawn up a code of conduct for the centre and people contravening it will be asked to leave the complex. The rules outline the standard of behaviour expected, including not smoking, leafleting, or canvassing on site. Guidelines say intimidating behaviour by groups or individuals, anti-social behaviour including swearing, and wearing clothing which deliberately obscures the face such as hooded tops and baseball caps, will not be allowed. Ms Smith said: "We're very concerned that some of our guests don't feel at all comfortable in what really is a family environment. "That's feedback from retailers, our own staff and from our on site police force." Brits can survive the Blitz but find hoods intimidating? 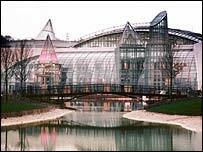 She said there were nearly 400 CCTV cameras at Bluewater which were being constantly monitored. North Kent Supt Martin Hewitt said: "By clearly setting acceptable standards of behaviour, this code will allow staff and police officers to work together in maintaining the quality of experience for guests."